IT’S SPRING, WHEN Northwest farmers are warming up for their busiest months, right? Not at Boldly Grown Farm in Skagit County, where owners Amy Frye and Jacob Slosberg are done with the winter rush and are preparing for their version of the offseason. The certified organic farmers focus on crops that can be harvested in the fall and winter and stored through early spring. They even run a CSA (Community-Supported Agriculture) service from October to March, the flip side of what most farms offer. The couple recognized that available niche when they started Boldly Grown in 2015 on an acre of land they farm through the Viva Farms nonprofit incubator. They’ve since expanded to 6.5 acres on three Viva parcels, with a focus on unusual squash that store extra-well and can be tailored to grower preferences. Visiting in the fall, I was particularly struck by their personal-sized, microwaveable spaghetti squashes, pale rounds that looked more like bocce balls than footballs. Heaped high in other bins were adorable red kuris and blue-green kabochas that could have been a single serving instead of food for a crowd. Preferences might vary between the wholesale clients they serve through the Puget Sound Food Hub and CSA customers between Seattle and Bellingham. Some restaurant clients prefer the giant squashes, the farmers say, for their better skin-to-meat ratio and lower net prep time. But home cooks might not have the equipment to easily hack up monster-sized vegetables with hard rinds, or the storage space to use the cut squash before it spoils. Besides, the smaller ones “are super-cute, and people just love mini stuff,” Frye says. 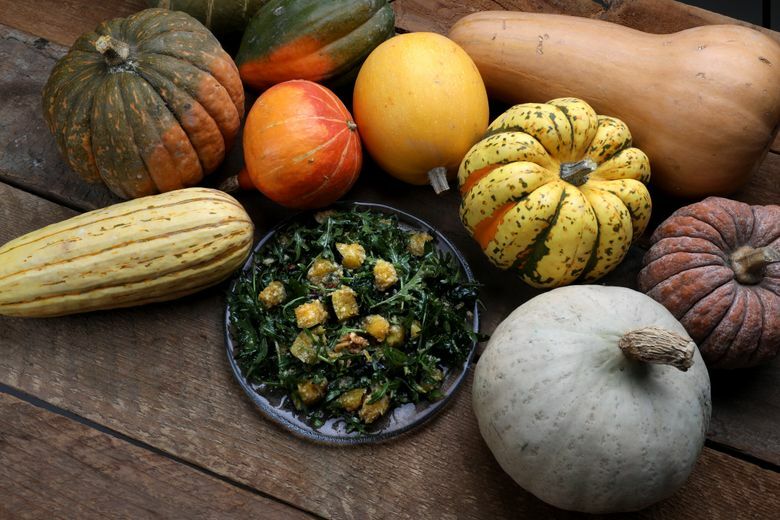 Some of the petite products come from squash varieties that are naturally small; others are coaxed along by adjustments, like planting kabochas closer together to discourage giant-size rounds. This year, they’ve been looking at new varieties with long shelf lives, like tetsukabuto, an “ugly wrinkly” mix of kabocha and butternut. Their CSA customers got a different variety of squash each week. It’s a different sort of production than Frye knew growing up near her grandparents’ farm in Minnesota. She met Slosberg, a Seattle native, at the Centre for Sustainable Food Systems at the University of British Columbia. They knew they were interested in farming together, but, “Land is really expensive anywhere near Vancouver,” Frye said. It’s hardly cheap anywhere near Seattle, of course, but better — and they were drawn to Skagit’s rich agricultural history and opportunities, and considered Ray de Vries of Skagit-based Ralph’s Greenhouse a mentor. The couple’s long-term aspirations include expanding Boldly Grown to 20 or more acres, and buying their own land. They’ve already expanded in another way; one of their own favorite uses for their mini-squashes was baby food for their son, now 2. My kids are older, but I love using small winter squash in this salad, which local foods pioneer Mark Musick served me for lunch one day. I told him I had to have the recipe, and he referred me to an Ina Garten cookbook. Her recipe called for butternut; Musick used delicatas, and it’s been a family favorite of ours with small kabocha or kuri or whatever delightful new squash we can find. 2. Place the squash on a sheet pan (I line my pan with parchment paper for easier cleanup). Add 2 tablespoons olive oil, the maple syrup, 1 teaspoon salt and ½ teaspoon pepper, and toss. Roast the squash for 15 to 20 minutes, turning once, until tender. Add the cranberries to the pan for the last 5 minutes. 3. While the squash is roasting, combine the apple cider, vinegar and shallots in a small saucepan, and bring to a boil over medium-high heat. Cook for 6 to 8 minutes, until the cider is reduced to about ¼ cup. Off the heat, whisk in the mustard, ½ cup olive oil, 1 teaspoon salt and ½ teaspoon pepper. 4. Place washed and dried arugula in a large salad bowl, and add the roasted squash mixture, the walnuts and the grated Parmesan. Spoon just enough vinaigrette over the salad to moisten, and toss well. Sprinkle with salt and pepper, and serve immediately. *Peel the squash if the skin is thick, as with butternut squash. The skin on many other varieties, e.g. kabochas and delicatas, is generally edible. Rebekah Denn is a Seattle food writer. Reach her at rebekahdenn@gmail.com.